InsightLA and Firefighters Down partnered to host the Mindfulness in Nature Retreat that was held on the insightLA -17 acre Beverly Hills (Benedict Canyon) property on July 25 and 26. This two day retreat was attended by Firefighters and their spouses, one Firefighter who brought his teen daughter and the wife of a deceased Firefighter along with a few guests. Accommodations were provided by the Sportsmans Lodge which was a stone’s throw away, allowing all attendees to remain in a sacred state during the after hours. Earlier in June, Lakota Elder Soldier Bear traveled from the Pine Ridge reservation to perform a ceremonial blessing of the property and the upcoming retreats. This ceremony was empowered by having a Red Tail Hawk and a Turkey Vulture present while sacred drumming and songs were offered. This ceremony cleared the space for the Firefighters Down team, InsightLA executive team, sponsors and partners, all on a path of truth to feel united in a good way. Each day was commenced under the same Pepper Tree that was previously blessed by Soldier Bear with prayer, song and smudging. Dr. Nasazi Malonga of the Dharma Health Institute delivered a soul-stirring narrative on day-one and Dr. Stephen Johnson, Executive Director of The Men’s Center Los Angeles, provided powerful opening words, a prayerful blessing and smudging on day two. Following each day’s opening Ceremonies all participants transitioned inside for Dr. Babette Rothschild and Dr. Christiane Wolf’s teachings on mindfulness practices. Everyone shared, learned and grew in awareness and insight. Dr. Johnson shared his knowledge to the group at key moments. Day One was ignited when Christo Pellani created a sacred drum circle under the Pepper Tree. It brought all of our souls closer to the power of nature and spirit. 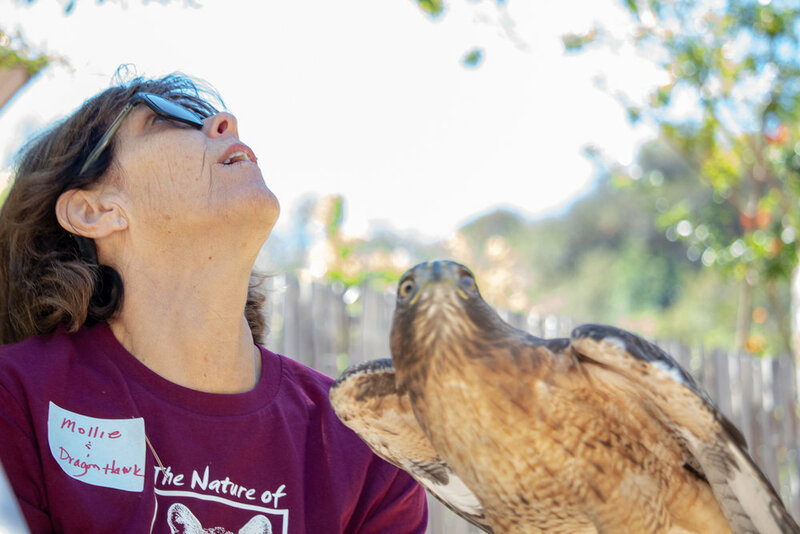 We drummed in unison under Christo’s guidance to the 7-sacred directions followed by the director of Nature of Wildworks Sanctuary in Topanga entering the circle with a majestic Red Tail Hawk named Dragon. The beauty, power and creativity of his spirit enticed all attendees to leave the industrialized city behind and connect deeply with the beauty and simplicity of nature. 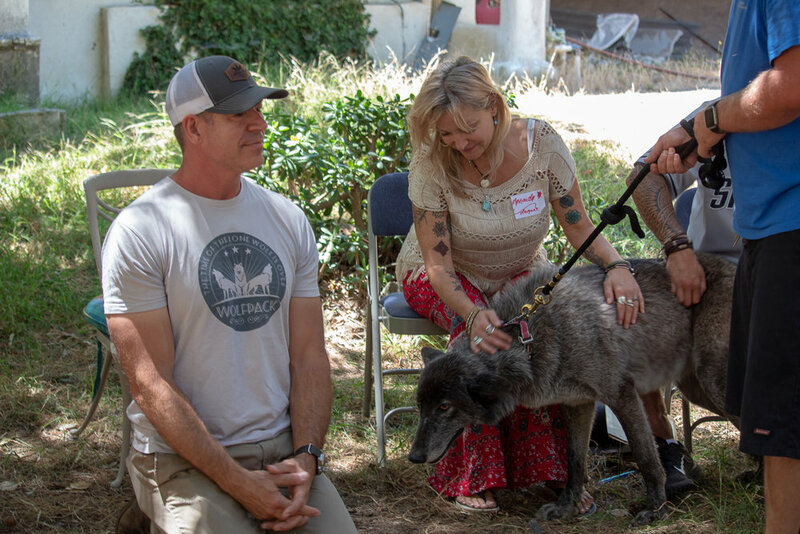 We were honored to have a powerful presentation on Day Two presented by Philip Folsom on the four archetypes of the mature masculine and feminine followed by a visit from two prized wolves from Wolf Mountain Sanctuary. The impact and intended goals of the first Mindfulness in Nature Retreat were realized and surpassed. Our closing ceremony was also attended by our sponsors and all couples received a sacred feather and sage to commemorate their experience. A highlight of Day Two was a key visit from LA County Deputy Fire Chief Montoya, who expressed a message that our program has the full backing from La County Fire Chief Osby..
Official recognition and acceptance by the 4000 member La County Fire Department is extremely special and a big step toward National Recognition. La County Fire is the head Department for the United Nations Urban Search and Rescue team. We believe that international recognition of Firefighters Down is within reach. Sadly, June 25, the first day of our retreat, was the day that Long Beach Fire Captain David Rosa was shot and killed in an ambush while he was in the line of duty. We spoke about the dangers that Firefighters are dealing with now on levels that were not present in past years. Men’s Center Los Angeles, Dharma Health Center, UCLA Operation Mend, NFL Travel Directory, Wolf Mountain Sanctuary, Wild Note Sanctuary, Essentia Water, and California Casualty. We plan to have several Firefighters in attendance at the December 6-9 MCLA Sacred Path Men’s Retreat.